Gluten Digest, with BioCore DPP IV (Dipeptidyl peptidase IV) is a digestive enzyme that can be supplemented alone or in combination with other nutritional enzymes to support the digestive process. This unique enzyme specifically breaks apart difficult-to-digest proline-containing peptides, which are generally known to come from dairy products and cereal grains. 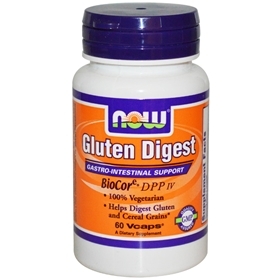 Gluten digest also contains amylase and glucoamylase enzymes that assist in the breakdown of carbohydrates. The proteases in Gluten digest are stable in the acidic environment of the stomach and are 100% vegetarian. Gluten is found in grains such as wheat, barley, rye and triticale. When gluten reaches the digestive tract of certain individuals, the cells of the immune system mistakenly believe that it is coming from some sort of foreign invader, like a bacteria. For those people who are sensitive to gluten, this causes the immune system to mount an attack against it. Suggested Usage: As a dietary supplement, take 1 Vcap® at the beginning of any meal that may contain gluten. Best used in combination with NOW® Optimal Digestive System or Super Enzymes.